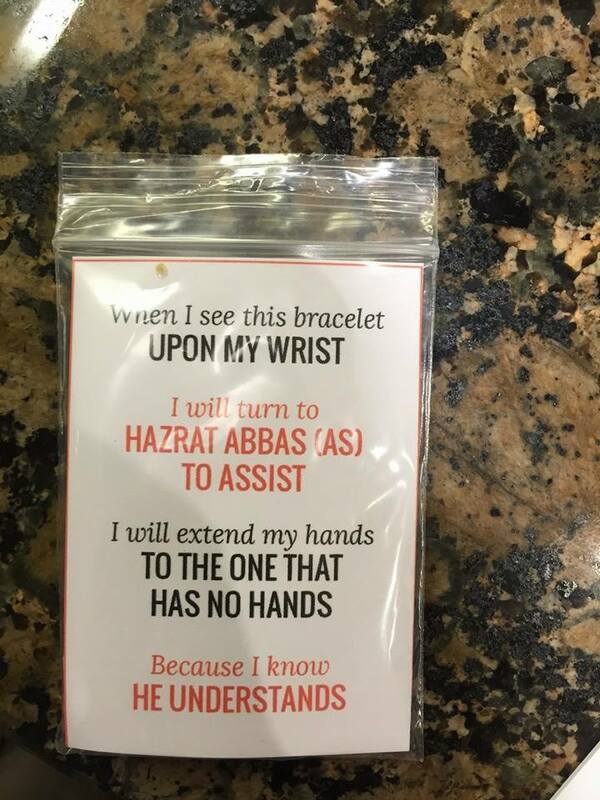 Another great product – a drawstring bag which can be used for mosque, school, etc! Subhanallah! I am in AWE! 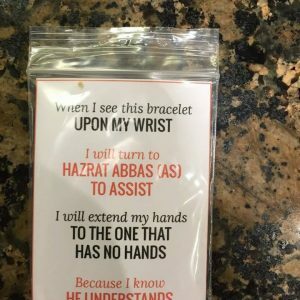 Teach your children that the tears for Imam Husayn (as) have shafa – indeed, tears have been found to have different chemical content, depending on why they are being shed. Encourage them to wipe it on their faces and body, rather than wiping it away with a tissue. In the same vein: We need to put the love of Islam into our children BEFORE the law. When they are older, if they rebel against the law, it will be the love that will bring them back. Don’t underestimate the value of maatam and the symbol of what it stands for. Teach your children it’s importance and to take part, even if they don’t understand it yet. In Russia, when it was difficult to openly practise Islam and commemorate, Muslims developed a softer, more secret way to do maatam rather than give it up altogether. They would slip their hand in between buttons and place it on the chest and whisper, and they taught their children to do the same. We listen to lectures year in, year out – but the change in us in minimal. How can we change this so that the knowledge turns into action? One suggestion is that we reflect on it and pull out a point of action even after the majlis. On the way home, why not start a family tradition on what each family member learned and one small thing they are going to try and change based on that? Today’s Muharram gem comes in the form of this video. In yesterday’s lecture, Sheikh Abbas Jaffer talked about wealth, and the duties that come with it. Watch this video with your children, about the inspiring billionaire who gives 99%(!) of his wealth to developing long term solutions to world issues such as water, energy and health. I am going to veer from my usual posts with this one, but I believe it is valuable Inshallah. Alhamdulillah, this page has Muslims of all sects, but inevitably every Muharram, those of the Sunni faith start ‘un’liking the page as the posts about Imam Husayn (as) and Kerbala begin. But as this eloquent Khutba from last Friday by renowned Sunni scholar, Imam Khalid Latif at the Islamic Center of New York University shows, this event is not just one for Shias to commemorate. It is part of a MUSLIM history, and one with lessons for all. Well worth a listen! We are ONE Ummah! Wow wow wow. If the Quran has such a positive effect on random strangers, imagine the effect on believers, who read it with meaning?! He has no physical sight, yet his spiritual sight is a thing of beauty! May Allah grant us all his faith…totally, totally inspiring. And here are some more to inspire you! Post by Autism Awareness – Muslims on the Spectrum. Respecting the Elderly - in action!